Its sad how familiar I've become with this diagram. So for a quick recap - everyone seems to be of the consensus the hairs inside my cochlea died back in September and resulted in my hearing loss. This is based on comparable cases where autopsies were performed long after the fact. The hairs themselves are too small to be seen on any test so its an educated guess. Regenerative growth is still being tested on animals so chances of them bouncing back on their own are non-existent. The ENT back in December made it sound like a cochlear implant was the way to go. Cochlear implants in folks with single sided deafness in the USA is still very new. Remember my ENT said I would be the first at the Ear and Eye institute in NY? This is a research facility hospital and I would be FIRST! That is not a Caps Lock of Excitement dear reader, that is the Caps Lock of Incredulous Fear. I went in to the NYEE Cochlear Implant Center today for testing but I didn't realize I was being recruited for a study to help get single sided cochlear implants approved in the USA. NO WAY! I didn't have a blog back then but the last thing I beta tested was a sidekick phone and I swapped that handset out so many times it never even got a chance to get a scratched screen. Cochlear implants? Can't be swapped out. I already had a ton of reservations with getting a single sided implant based on my Lasik experience. I only had lasik performed on my right eye because the left is technically blind. I can detect colors and movement up to a certain distance but details and depth perception? Ha! I parallel park based on past experience and faith. Anyway after lasik all the discomfort was in the eye which they did not operate on. It constantly felt strained and if I hadn't been awake during the procedure I would have been sure it had been tampered with. The end result was my vision in that eye improved! I will never be able to read or even pick someone out of a lineup with it but I can see further. I never measured but in order for me to detect motion on that side I'd guess it would have to be within 10 feet of me so if someone approached me from that side it would appear as if they came out of nowhere. I used to jump in surprise all the time. After lasik I'd say I can detect motion at at least twice that distance. Now - this implant would be in my damaged left ear so what will it do to my good right ear? Nothing say all the docs based on no research they are sharing with me. My skepticism is beyond caps locking. How can having a machine permanently implanted and constantly transmitting NOT affect the good ear? In the short time I've been without hearing in my left ear the right has adapted miraculously. It doesn't admit all sound, it helps me focus on specific sounds, its even become better at localizing. Its had to do this because there wasn't any input from the left side. Here's the thing - no one likes their cochlear implant at first. The audiologist even said it today. It takes time to train you brain to correctly interpret sounds - in one of the books I read the guy heard the sound of turning pages as metallic dings. He knew that sound wasn't right but his brain insisted that's what turning pages sounded like. Of course after months of mapping and training he heard pages turning as they should but that's MONTHS! Guys I have a good ear. When I wore the baha headband it sounded tinny, mechanical and wrong with my good ear covered. When I uncovered the right ear it overrode the icky left sound and let me hear things correctly. I only wore it for a few minutes though. What if the left ear was constantly saying "mechanical stuff is better!" Wouldn't my good ear eventually have to accept and incorporate that badness!? The audiologist says that is what the study will determine. I'm not sure what a cochlear implant costs today - my books say around 50k but I know anything printed is already out of date. So even if we halved it and said this operation would cost $25,000. Whatever insurance doesn't cover would be covered by the grant - that's how desperate they are to get participants! And here's the big thing guys - I'm 36. I hope to live a while longer. Perhaps I will live long enough to get good enough imaging to see what really happened in my ear. Perhaps I will be around when hair cell regrowth goes into trials. Getting a cochlear implant would preclude me from being helped in any other way. Without being too technical part of the operation involves inserting a flexible tube with receptors into the cochlea, where the mostly dead hair cells hang out. After a time the body creates a "sheath" around that tube and while it can be replaced by another tube of the identical size or smaller later on that sheath effectively kills any remaining hairs and would prevent anything from growing in there again. Now I do have some hearing - some terribly damaged hearing - in that ear. The audiologist cranked a hearing aid to the point where every word caused my ear to vibrate and my jaw hurt after listening to it for the duration of a hearing test but something is still working in there. It doesn't have support but its chugging along and I don't want to kill it. 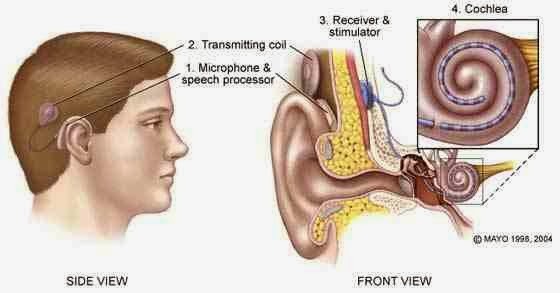 A cochlear implant entails the tube in my cochlea, the processor implant under my skin behind the hear, the magnetic receiver over the skin AND the ear piece which looks just like the hearing aid I wore on Wednesday - PLUS sound isn't localized!!! Asides from price there isn't a single thing better about a cochlear implant. I was very hesitant and very worried of getting this implant when I thought it was my only option for hearing again but now that I know life doesn't have to be that way? You won't catch me beta testing with my one good ear! I can't speak from any sort of experience, but it sounds like you've done your research and you've come to a good decision for you, and that's all that really matters. Has the physical pain subsided? Keeping you in my thoughts and prayers.